If you missed out on the Democratic debate on Thursday, fear not: You'll get a second crack at hearing two politicians' blustery speeches on TV this week. Except this time, they're both Bernie Sanders. If you're confused, well, it's because that lede is so-so. But to clarify: Larry David is hosting "Saturday Night Live" this week, and is sure to bring back his recent impression of the Senator from Vermont. 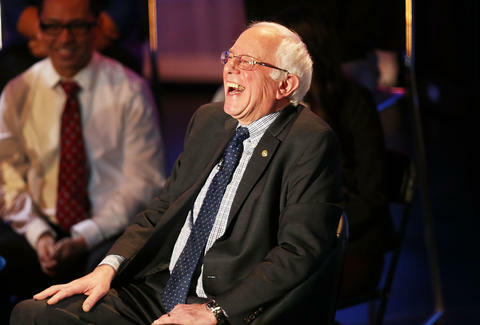 But in a surprise twist, sources familiar with Sanders' travel plans told The Washington Post the presidential hopeful is set to travel to New York on Saturday, "where he is likely to make an appearance on 'Saturday Night Live.'" Neither SNL brass nor Sanders' people have confirmed the cameo. But Sanders has praised David's impression of him previously, and it could prove an opportunity for the senator to connect with an even broader base of potential voters -- namely, people who watch funny things. As for what skits Sanders could appear in: it'd be obvious to play himself. Or even Larry David. But maybe, JUST MAYBE, they'll reboot the Chippendale's dancers sketch starring Patricks Swayze and Chris Farley together. Actually, let's hope that's not true. Ryan Craggs is Thrillist's Senior News Editor. He has seen just about every episode of SNL from the 1990s. Probably more than once. Follow him @ryanrcraggs.